I am a good farmer! - Agfinity Inc.
As Harvest 2018 ends, I feel the Agfinity team and I have earned honorary master’s degrees in psychiatry. Then again, no degree is necessary to sense the grief that has mangled the prairies this fall. This harvest has beaten some farmers up so badly, they’ll be nursing their wounds for the rest of the crop year and beyond. We’ve said it before, but nothing is more encouraging than an optimistic outlook. When you’re faced with negativity at every turn yet choose to focus on what’s good and how it will be even better… that’s magic! “Well, there’s always next year!” A customer near Lamont said after we mulled over a few lackluster options for their damp feed grain. You see, negative thoughts are like a fungus… See how I tied in the mushroom right away? … When you reject negative thoughts, they lose their power. They lose their ability to grow. And better yet, each time you capture and destroy a negative thought, why not give birth to a true, positive one? At first this will feel unnatural. Even a little awkward. 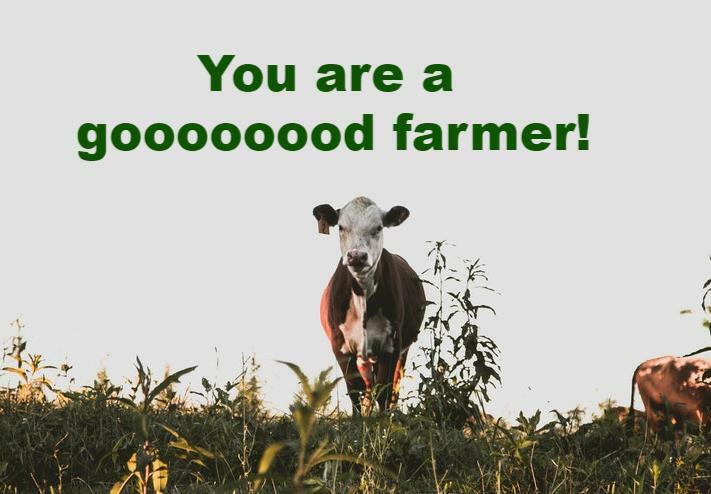 But the truth is, you are a good farmer. Go ahead, say it! Good, now a little louder. Good, good. Now try it with an exclamation point this time. Nicely done! And good touch with the extra exclamations! That was a little weird, I know. But the truth needs to be heard, and who better to say it than yourself! Barley: Across the prairies, harvest is (mostly) complete and winter has arrived. With the arrival of snow here to stay, we also saw the departure of the harvest pressure depressing the feed barley market. Bid’s into the Lethbridge market have jumped $5-10/MT and we are now seeing stronger carry further out. Wheat: Feed wheat is seeing a rally as well with harvest pressure easing off. In addition, some large feedlot operations are adjusting their rations from corn to wheat in December/January. This should eat through the excess of supply and carry has developed in the market. If you still have high moisture wheat, homes have reopened for it as well. In the milling market, spring wheat has seen a bump up on the back of a disastrous year in Australia. Durum pricing remains depressed seeing $5.90-$6.05 delivered in southern Alberta. Oats: Demand for feed and milling oats is remaining steady. The quality requirements for milling oats remains the same despite some thought of higher moisture tolerance. No signs of any adjustment there. Compared to this time last year, oat prices are up approximately 3%. Canola: Overall, the past two weeks, we have seen the price for canola slump, and in the past few days, bump up again. The increase was on the back of a soybean price increase due to renewed trade negotiations between Trump and Xi Jinping. There are homes available for green and tough canola. Dry, 50% green trading around the Edmonton area at $5/bushel FOB farm. Peas: Yellow peas are trending in the right direction (if you’re selling). Pricing has increased for November-December and there is approximately $0.25/bushel carry going into January-March. Overall, the outlook appears bullish for 2019 on yellow peas. If major global players come back to the table we may see another increase. Aside from canola that is still in the field, harvest is, for most producers, complete. With winter settling in, harvest pressure has subsided and demand is increasing. Buyers have strong coverage for November and most of December. If sellers are needing shipment before the new year, it likely will need to go into southern Alberta where homes are also slim. Main demand and pricing opportunities right now are for January – March where higher tonnage offers are able to pull the highest bids. Feeders in Lethbridge are trying to chew through their corn contracts so they can buy wheat and barley again. Buyers are seeing a vast amount of feed grain this year and are hoping to buy at lower values than corn. Larger tonnage offers for January – March are of interest to buyers for barley or wheat. The best strategy is to get buyers covered into the spring with enough tonnage so that corn is not needing to be considered as an option. If you see these two, make sure you say hi!! They may have some goodies to share with you and would love to chat about the markets, and really anything else you want to talk about! They are great listeners! Looking forward to seeing you there!